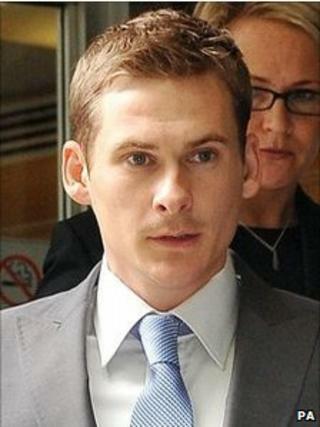 An assault charge against singer Lee Ryan has been dropped at the request of his former fiancee Samantha Miller. The Blue star denied attacking 26-year-old Ms Miller, the mother of his two-year-old son, on 18 August. The assault was alleged to have happened in a car in central London, while the couple were still together. They split up last week. The 27-year-old, of Henley-on-Thames, Oxfordshire, appeared at City of Westminster Magistrates' Court. After the assault allegation was read out by the clerk, prosecutor Laura Tams asked for the charge to be officially withdrawn. She said: "I have this morning been handed a withdrawal statement dated 25 August, signed by Samantha Miller. "Having taken further instructions there is no longer a realistic prospect of conviction. I ask the court therefore to withdraw the charge." Ryan's counsel, Raymond Lewis, said the pair met several years ago. The couple had been together "up until last week", he said, adding: "It has been a somewhat unhappy and volatile relationship." Mr Lewis added: "Over the last couple of years, complaints have been made on six occasions, in Oxfordshire, London, Paddington Green and Belgravia. "None of these matters have ever proceeded to court. "Had this matter been contested, it would have been fought tooth and nail." Mr Lewis said he intended to apply for costs on behalf of his client. Ryan's publicist, Simon Jones, said the singer "has always maintained his innocence and is relieved at the outcome, but is sad that such a case had to take place".